The newest member of L Pod known as L124 or "Lucky" appears to be in good spirits and wasn't having trouble keeping up with its mother last week. The newest member of L Pod appeared to be in good spirits when it was spotted last week. At approximately three weeks old, the Southern Resident orca identified as L124 or "Lucky" was "bouncing around" between several other members of the pod on Friday, according to the Center for Whale Research. Some of the first images since L124 was initially identified were released by by the Center for Whale Research. The following image shows L124 with its mother, L77. 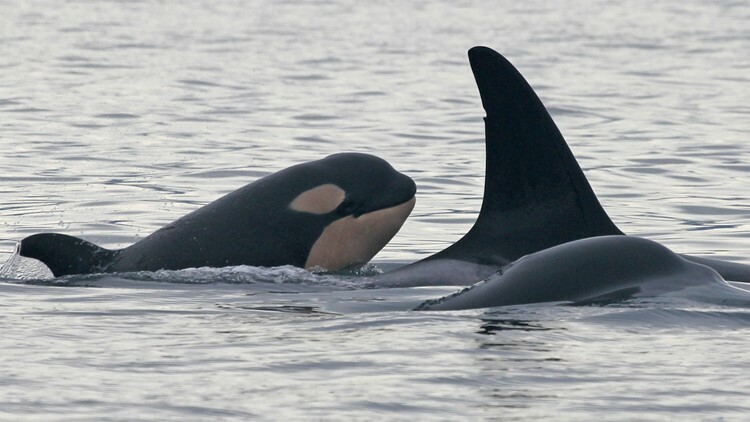 Orca L124 or "Lucky" seen with its mother on Jan. 11, 2019. A video posted by the Center for Whale Research shows L124 with other members of L Pod last week. The calf, born into a local orca population that is struggling for survival, was reportedly keeping up with L25, L41, L77, and L119. The orca's gender remains unknown. Researchers identified the new calf last week after seeing aerial footage showing the orcas swimming near Vashon Island. There are two other pregnant whales in K Pod and J Pod. Researchers will be keeping a close eye on the orca calf. At least half of newborn orcas don't survive, according to Wild Orca Science and Research Director Dr. Deborah Giles.